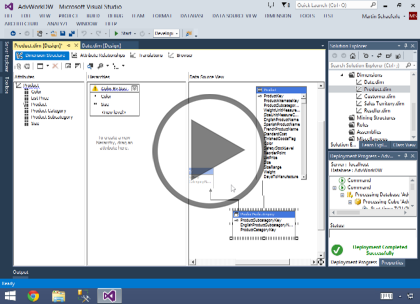 In this course, you will learn how to use Microsoft SQL Server 2014 Analysis Services (SSAS). This course includes concepts, procedures and practices based on real-world experience giving both the novice and experienced SQL Server developer the tools to build data warehousing and decision support system solutions. This course does not require any prior experience with Analysis Server. It is assumed that students have working experience with SQL Server; basic relational database concepts (e.g., tables, queries, and indexing); data transformation services. Using Microsoft SQL Server started for Thomas with a Laboratory Information System in version 6.5. The Analysis Service (also called SSAS) option in version 7 got him excited about Data Warehousing, but before he used a production version of SSAS, he became a Database Administrator for versions 6.5 through 2005 while working at a paper mill and home health agency. After writing reports as an application developer for 10 years, he rediscovered Online Analytical Processing (OLAP) implemented into Data Warehouses. Since 2009, he has become a speaker in the SQL Server community and a voice for Microsoft Business Intelligence (MSBI) for enterprises. His transition from Sr. DBA to a Business Intelligence Architect has been a great career path. Thomas has certifications MCP, MCDBA and MCITP in Database Administration and Business Intelligence.